The D-Link AC3200 Ultra Wi-Fi Router is one of the best routers in the market and is sought after by gamers who want unrivaled performance even while multitasking.We are connected more than we would like or think off. Nowadays, each household is a hub of many devices that are connected with each other using the wireless router. Some routers can’t handle the traffic properly leading to performance issues, disconnections, and frustrations.The idea of D-Link AC3000 Ultra Wi-Fi Router is to provide a seamless experience for all devices connected to the network, whether it’s by laptops, smartphones, Smart TVs, gaming consoles, tablet and much more. This Wi-Fi router offers an unique design and it will awe-struck anyone at first glance. The drone-like design is specially built to go well with a gaming machine, but it also showcase the futuristic value it holds when it comes to technology and performance. If you find the unit to be too eye catchy, it can always be mounted on a wall behind a TV or placed in the network closet. The D-Link AC3200 Ultra Wi-Fi Router is full of ports ready to be utilized for your work. There are one USB 3.0 Port and an USB 2.0 port for you to plug in a USB flash drive and share it with other devices on the network. The USB 2.0 port can also share devices like a printer. It also includes a WPS Button, four Gigabit Lan ports, and a WAN. With 4k displays, connected devices and streaming media, the demand for bandwidth has tripled in the past few years. To keep up, the gamer often utilizes devices that compliment each other. 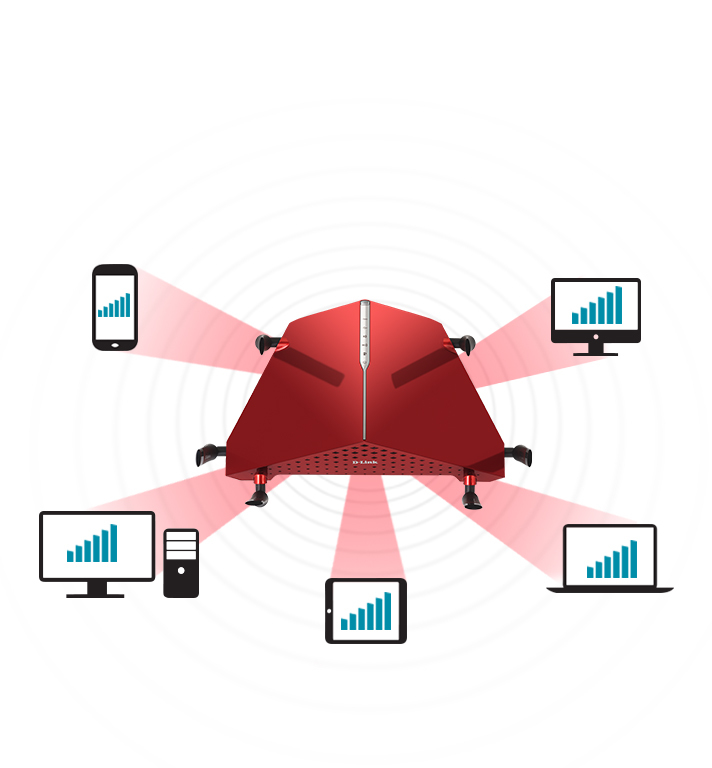 To make data streaming as efficient as possible, the AC3200 Ultra Wi-Fi Router comes with three bands. All of these bands have their own individual capacity and do not interfere with each other. There is one 2.4 GHz wireless band capable of offering bandwidths up to 600 Mbps and two 5GHz wireless band capable of offering bandwidths up to 1,300 Mbps. When combined they can provide streaming capacity of up to 3200 Mbps. The AC3200 handles the priority bandwidth allocation on the fly using the Intelligent QoS. The intelligent QoS monitors all the wireless traffic, which can include HD video streaming, online gaming, web surfing or more, and quickly understand the requirements and change the priority and channels accordingly. Intelligent QoS is simple the best possible way to manage the network bandwidth. If you want to give any application priority, you can always modify the QoS settings in the very intuitive user interface. With the AC3200 Ultra Wi-Fi Router you can plug a USB flash drive into one of the USB ports and stream insanely high-quality media to your Smart TV. This Wi-Fi router is more than capable of handling parallel high-bandwidth connections because of the Tri-Band technology. Smart Beamfocuses on bandwidth control of your device even when you move around the home. With the freedom of movement, you can Skype with your friends, browse the internet, play games in your portable smartphones while the D-Link router continues to provide the best possible connection. Wireless security have always been an important topic and many have shown that wireless connections are the least protected of all of them. To achieve maximum security, the Wi-Fi router offers L2TP Over IPSec VPN Server support, which in layman terms means that you can create a secret channel over your network with no access from the outer world. The Wi-Fi router offers parental control and guest Wifi accounts for better access control. WPA/WPA2 security encryption algorithms are used to secure the wireless connection. The router was easy to install. There was no manual configuration and the wizard helped us setup the Wi-Fi connection in minutes. Once the wireless connection was up and alive, we used the Quick Router Setup (QRS) App to easily setup the wireless connection for tablets and smartphones. The router can be management with the help of the MyDlink Lite App, which helps you to monitor the wireless connection from your mobile device. You can also troubleshoot the connection with the help of the device. The Wi-Fi router also offer the WPS Push Button Setup that can connect devices in matter of seconds. 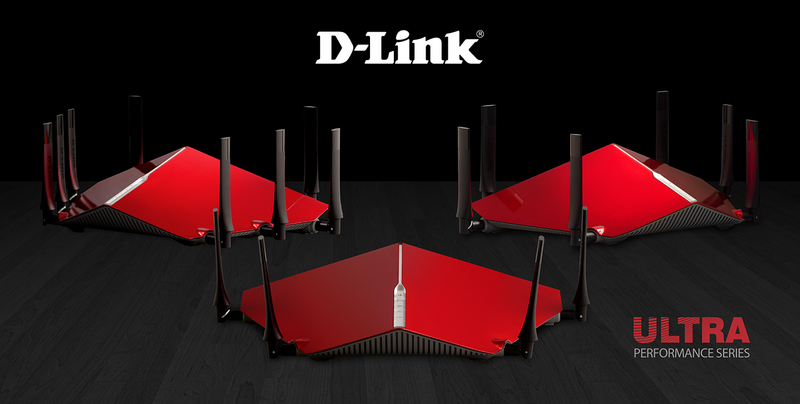 The D-Link AC3200 Ultra Wi-Fi Router is an essential tool for gamers and tech savvy homes. It showcase how our technology has advanced and provides a seamless performance and user experience. Installation is easy and intuitive with a breath of documentation and installation guides online. It doesn’t matter whether you are streaming 4K video to TV or playing online game, the D-Link AC3200 Ultra Wi-Fi router doesn’t disappoint.